"Tomorrow we schoolstrike for our future." 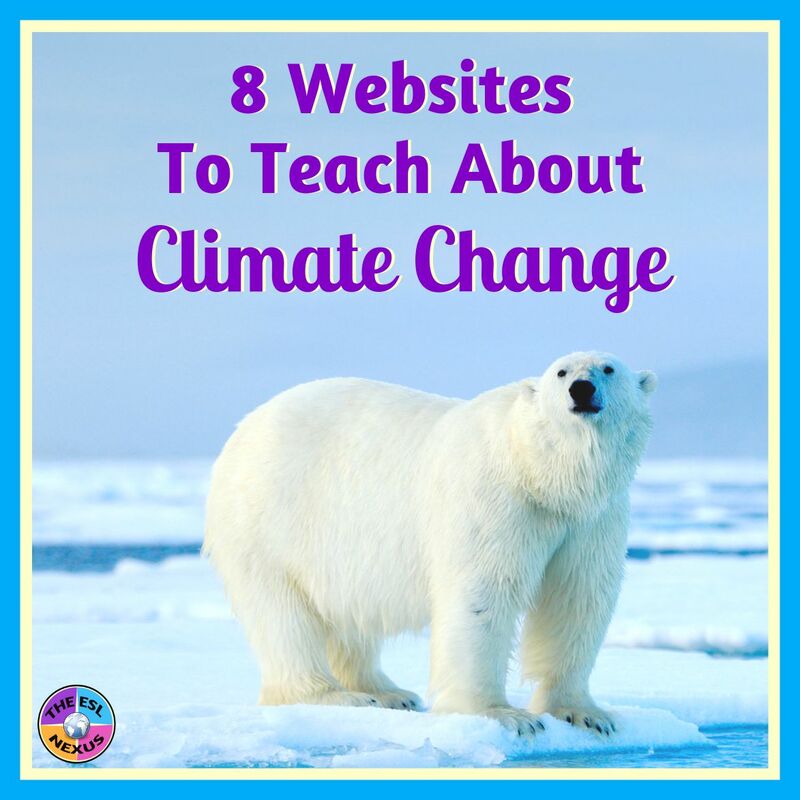 Below are 8 websites that will help ELLs (and other students) learn about climate change. I’ve included a short description of each site and rated the level of language proficiency needed to comprehend the information in them. They are not listed in any particular order. Read about 7 ways you can get your students involved in learning about and having a positive impact on climate change in this blog post. Within each category, 2-3 actionable ideas are offered. Webpages that answer “Big Questions” and provide info about weather & climate, the atmosphere, water, energy, and plants & animals. Includes videos, games, and activities that explain concepts in easy-to-understand ways. Lots of visuals make this site appropriate for ELLs and other students reading at a middle school grade level. An informative website that explains the science behind climate change, what the greenhouse effect is, the impact of climate change, and what people can do about climate change. Includes some visuals but is mostly text-based. Links to many more webpages dealing with climate change and the environment are included at the bottom of the homepage screen. A webpage with basic information about the causes of climate change and its effects on the planet, wildlife, and people. Webpages about climate change basics and the impacts of climate change, how to think like a scientist, things people can do to help the environment, and how climate change affects different parts of the world. Each webpage has text and visuals along with links to further information. Some pages have interactive activities that students can do. A 3-minute pictorial guide explains climate change in language that is suitable for lower intermediate learners. The homepage has a table of contents with 10 links to click on for info related to climate change. Those pages include explanatory information, visuals, and links to even more information. The webpages are colorful and the paragraphs are short and written in informal language. A nice bonus is that the pages can be translated into 34 other languages, which is great for ELLs at beginning levels of language proficiency because it will help them understand the concepts presented. The people behind this guide also offer 8 other Guides for Kids HERE. This website includes articles, videos, games, quizzes, and activities about climate change. Lots of visuals and short texts help make the colorful webpages comprehensible. This is a short video, less than 3 minutes long and narrated in British English, which explains how CO2 is harming the planet. You can show the subtitles but they lack punctation so it might a little hard for some ELLs to easily understand them. However, the video does a good job explaining the impact of rising levels of carbon dioxide in the atmosphere. For more ideas and ways to protect and preserve the environment, please check out my Gift Guide for Environmentally-Aware Educators.